Like many of my friends, I’m hooked on AMC’s Mad Men. Part of what I love about the show is the gorgeous wardrobe. While I wouldn’t choose to be a woman in the early 1960s I pine for those perfect clothes. Betty’s darling housedresses, Joan’s lacquered-on skirts, Peggy’s Madison Avenue working girl dresses – I’m in love with all their closets. So though it may be entirely unoriginal, I’m stepping out in full Man Men mode for Halloween. I poked around thrift stores looking for a Betty style housedress with no luck. 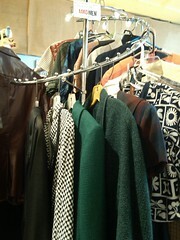 A friend at work reminded me of Nitty Gritty, the vintage store on Barrett, so I headed there and found Mad Men heaven. Of course the whole store is jammed with retro clothes and accessories, but they’ve made it easy for us Halloween costume shoppers – a Mad Men rack up front is packed with fabulous Mad Men dresses. I grabbed several of them, salivating in a way I normally reserve for cheese displays, and hit the changing room for a fun game of dress-up. I emerged looking and feeling like a 60s housewife dressed for a day in the city. Owner Terri Burt and the other staff helped me flit through the store in my utterly adorable grey belted dress choosing the perfect jaunty green hat, long white gloves and pearls – all vintage. What fun it must have been to dress back then! The dress will need to be taken in a bit, but it cost only $28 and it’s such a classic cut that I could wear it in 2010 and feel perfectly comfortable. But for now I can’t wait for Halloween when I step back to 1963 and go out in my full vintage costume.